Every little girl needs to be a princess on her birthday, so why not Walt's first princess (and I think his personal favorite) Show White. There are so many ways you can go with a Snow White party, you can focus on her relationship with the Evil Queen, her time with the Dwarfs, her love of the animals in the Enchanted Forest, or you can just incorporate it all. 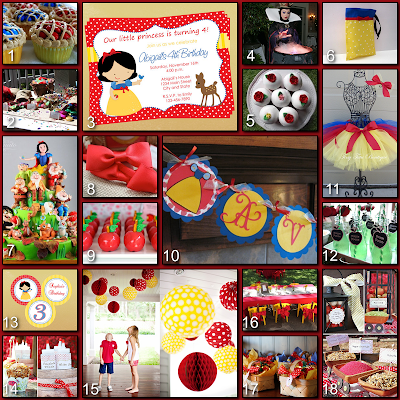 Our party board this week focuses a lot on the colors that make you think Snow White - yellow, red and blue. We have added touches from her relationship with the Evil Queen with Poison Potion and lots of apples, the Dwarfs are evident in the jeweled candy and Mine Cart apple bar. Pie Cupcakes - Snow White loved to cook and used fruit she found in the forest. These cute pie cupcakes are a nod to her cooking for the Dwarfs. Candy Jewels - Rock Candy and chocolates wrapped in jewel tones pay homage to the Seven Dwarfs and their work in the mines. I love the added touch of the burlap sacks!! Invitation - These cute invitations are a reminder of Snow White's connection with the animals in the Enchanted Forest, in particular the birds. Evil Queen - This particular Evil Queen is from Walt Disney World itself, but you could have your own Evil Queen show up to offer the party goers apples, although I doubt anyone would take her up on her offer. Cupcakes - These simple cupcakes are perfect with the white fondant that makes the simple red flowers pop. Treat Bag - This simple bag is perfect for little girls to carry their trinkets in. I love the idea of giving them something they can use later instead of something to discard. Cake - This elaborate cake truly shows all parts of Snow White's story. Headbands - Snow White is known for her pretty red headband and the girls at the party can use it over and over again. Apples - How cute are these apple cake pops with pretzel stems!! A perfect bite size treat. Birthday Banner - The adorable banner is the perfect compliment to the other decorations at the party. And the birthday girl will love it!! Tutu - The only thing better than a princess is a ballerina princess!! Transform your birthday girl into a beautiful Snow White Ballerina. Poison Potion - Be careful what you drink, the Evil Queen has been seen hanging around this party!! Cupcake Toppers - These cute cupcake toppers are the perfect match to the invitations. Pair them with red or blue cupcake wrappers and your cupcakes will be perfect. Caramel Apple Bar - Let the kids make their own caramel apples complete with all kinds of toppings displayed in carts from the diamond mines. Paper Lanterns - How perfect are these paper lanterns? Just add a few blue ones to the mix and you are set to go. Kids Table - This lower table with yellow kid size chairs is perfect for younger children. Goodie Baskets - An alternative to the treat bags (#6) are these cute baskets filed with great things for your party guests to enjoy at home. Lantern/Apple Bar - Another view of the offerings at the DIY apple bar. The metal lantern here is so cute filled with red and white gumballs, a great idea for a party favor for the boys at the party. 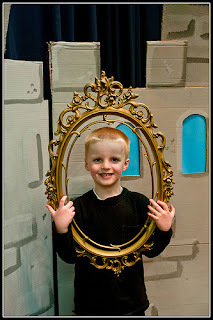 Use an oval shaped frame to make all of the party goers feel like the Fairest of them All, be sure to take pictures!! Hope you enjoyed our Snow White Party. If you have any great Snow White party ideas we would love to hear them. You can post in the comments section below or email disneydonnakay@yahoo.com.